Zavvi claim to have the cheapest Xbox One console around, and they weren’t kidding. 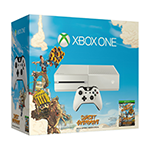 Pre-order your Xbox One with Sunset Overdrive for only £339.99 with free delivery! Release Date: 31 October 2014. Whilst stocks last.